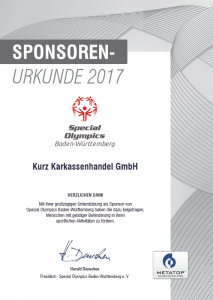 In a Sponsorship , KURZ Karkassenhandel GmbH supports the initiative “Babynotarztwagen Felix” of the Björn Steiger Stiftung since 2015. “Felix” is the first mobile intensive care unit for the optimum transport of early births to a special clinic. 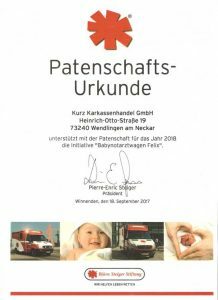 The emergency ambulance is used to transport early births and seriously ill newborn babies to a special clinic in event of emergency. Thanks to the best transport conditions, late damages can be avoided and the chance of survival is increased. Every year animals are exposed. 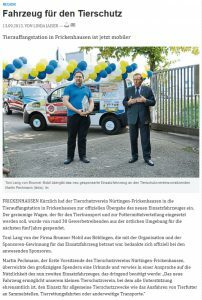 In the animal shelter in Frickenhausen, they find a new home. 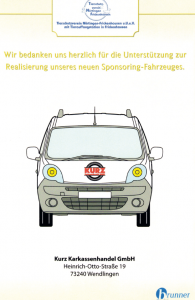 We are pleased to have contributed as sponsor for the new rescue vehicle of the animal shelter Frickenhausen.